Mr. Green is one of the best known casino brands in the world. Even though they mostly target scandinavian markets, they’ve earned a strong reputation worldwide. The company is fully licensed and registered in Malta and offers tailored services for people in Sweden, Norway, Finland, Austria, England and Germany. You’ll find over 200 casino games offered, with new ones being added every week. They also look out for you and have implemented a stop lose system that is known as ”Green Gaming” and lets you limit the funds you’re spending. 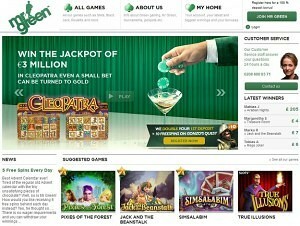 Mr. Green is powered by NetEnt, one of the industry leaders in online gambling software development. Games you’ll find at this casino truly stands out with their graphics, sounds and features offered. Games that can be found at Mr Green Casino are also powered by IGT, BetSoft and MicroGaming. The variety of games that you’ll be able to play is truly impressive. When talking about compatibility, all the games can be played with no download required and directly from your browser. Given the amount of software providers you can probably get an idea about the amount of games that can be found & played at this casino. We honestly don’t think that anyone can feel short in this aspect. Let’s take a look at some notable games as well as variations offered. Mega Fortune – currently the most talked slot machine in the industry. It’s a 25 pay-line progressive slot that offers 3 jackpots that can be won via a bonus game. Why is it talked about? Well, it currently features a progressive jackpot that currently exceeds $12 million! Hall Of Gods – another progressive slot game created by NetEnt. 25 pay line slot offering a bonus game, free spins feature and top quality graphics. Scarface – a game created after the popular movie. This is actually a slot that features amazing video effects as well as a bonus game. ThunderStruck2 – a video slot machine themed after Thor and offering the latest invention by MicroGaming, 243 ways to win. There’s also a WildStorm feature that can turn any reels into wilds. Jungle Games – Net Entertainment slot game that offers some really shiny graphics and animations. Play up to 20 pay lines and win up to 200 000 coins. Not only Mr Green Casino offers a really wide range of online slots, but also a handful of variations for just about any table game out there. BlackJack – Classic, Professional VIP, Pontoon, Professional, HighRoller, Double Exposure, Single Deck, European, American, 21+3, 21 Burn, Pirate 21, Super 7. Roulette – Classic, Double Bonus Spin, Triple Bonus Spin, HighRoller, European, American, French, Expert, 3 Wheel. New players who join Mr Green Casino can take advantage of their welcome bonus offer, which is a 100% bonus up to $250. Once you make a qualifying deposit, the money will be instantly added to your account and ready for use at any games you wish to play. Of course, the welcome bonus features play through requirements, which are quite high for this particular one – you’ll have to wager 70 times the bonus amount, before they can be withdrawn. Only Slot Games and Parlor Games will count towards fulfilling these requirements, which means that all table games such as BlackJack can be played, but won’t help you to get any closer for clearing this bonus. As a European brand, Mr Green offers a wide range of deposit and withdrawal methods for their users. Worth noting that transactions are processed very first and you’ll receive your withdrawals within 48 business hours from the point they are requested.